when asking where did 77 and 93 go, you've probably had somebody mention the Sandia F-4 crash video to explain how a plane can virtually disappear. Since the above crashes help prove a plane can not and I've never seen a plane crash before or after 9/11 that disappeared, a fellow researcher and I came to the conclusion that this Sandia video is psyops, meant to make us think a plane could turn to powder from a high speed crash. Does anybody know another instance where a large metal object turned to powder after striking a harder object at a significant speed? I'm mean it turned to POWDER. Come on!!! Killtown on Mon, 12/04/2006 - 8:49pm. my guess would be that the relative speed of each crash would play a greater role in the end result.. my guess is that the plane in the video came cruising in for an emergency landing at < 200 mph? dz on Mon, 12/04/2006 - 8:49pm. is there any other crash and experiment that concurs with the Sandia test? Sandia IS the gov't and WORKS with the same agencies that were involded with 9/11. Killtown on Mon, 12/04/2006 - 9:12pm. all the footage i've seen of example crashes (asside from the one you refer to) are of landing speed crashes, which i believe is ~160mph if my memory serves me.. the remote boeing crash test dummy crash for example..
i dont see how who executed the test matters much in this example though. dz on Mon, 12/04/2006 - 9:44pm. A 9/11 at the WTC has been planned for a long time. The FBI were behind the bombing in '93. Who's to say they didn't originally planned to use "planes" that time? My whole point is I never saw/heard about this Sandia video until after 9/11 as I'm sure most of you didn't either and a LOT of people are using it to justify how the planes disappeared on 9/11. Killtown on Mon, 12/04/2006 - 10:16pm. Like the WTC, the plane hit the building and went INSIDE. In the process, it was shredded into small pieces. There are lots of photographs of these pieces INSIDE the Pentagon, exactly where you would expect to find them. I really don't understand why people think the plane would have bounced off the wall and landed on the lawn... And yeah, a seat probably won't survive that kind of crash, but a multi- ton landing gear assembly sure will... Also, I can't figure out why otherwise- rational people can so easily discount the testimony of dozens of eyewitnesses without A SINGLE person who witnessed the crash backing up their theory. Come on people! Anonymous (not verified) on Mon, 12/04/2006 - 11:16pm. You are making the conclusion that the plane turned to powder because you see powder being ejected from the point of impact. Thats fair, but the plane is impacting a slab of concrete 10 feet thick. The concrete is turning to powder and that is what you see being ejected, the pieces of the plane are surely within the ejected mass, but for the most part obscured, but not completely. The plane's pieces should be moving away from the impact area at different speeds and different angles. The concrete dust should also be moving away from the impact area at different speeds and different angles. There are pieces of the plane clearly seen at the leading edge of the ejected material. Other plane material can be assumed to be obscured by the concrete cloud. Because it is not visible, does not mean it is not there, especially when you can see what is obscuring what should be seen. imgstacke on Mon, 12/04/2006 - 10:08pm. whatever struck it apparently disappeared inside of it, where it exploded & burned. Anonymous (not verified) on Mon, 12/04/2006 - 10:12pm. Until they release the videos showinf something actually striking the pentagon (so far they are 0 for 3) we can't leave out the possibility that nothing struck the pentagon. imgstacke on Mon, 12/04/2006 - 10:19pm. just playing devil's advocate here.. gotta keep in mind the existing evidence, and what is required to believe in this alternative theory.. some of us here may just brush off this evidence as all planted, but the average joe wont..
thanks for keeping this mostly sociable ppl. dz on Mon, 12/04/2006 - 10:35pm. Hey thats all good, but they have videos of what happened. If it was a 757, why haven't they shown clear, visual evidence of a plane flying anywhere near the flight path that they claim ? Not jumping around the issue but lets face it, off all the places they could have stashed plane parts, it would be the pentagon. I am not well versed in all of the documented wargames that were run on 9/11, but I do not for one second put it past them to have yet another wargame run at the pentagon, complete with mock plane wreckage. The strongest evidence against that part being from flight 77 is the fact there is no video of the impact. Its not like they don't HAVE the video, but every single one that has been released to this day has shown nothing remotely like a flight 77. Let me put it this way, how did that plane part get past the pentagon's air defenses? And are there any plane parts found at the pentagon that are not light enough to be carried(planted)? imgstacke on Mon, 12/04/2006 - 10:49pm. one more question: that piece of the landing gear... is that in the up or down position? imgstacke on Mon, 12/04/2006 - 11:02pm. and NO landing gears found at Shankville in that "soft dirt"? No rims at Shanks either and only one at Pent! Killtown on Tue, 12/05/2006 - 12:34am. Yeah, the Pentagon is hollow, just like a bank vault is hollow. And, Aluminum airplane parts, steel and titanium engine components, and fireproofed seats, don't "burn up" in a hydrocarbon fire. Sorry, not remotely hot enough. Misses by 1000 degrees F. Oops for you. 'Bout fed up with Anonymous posters here, dz. craniac on Mon, 12/04/2006 - 10:20pm. cement, now is it? Does it not have numerous windows & lots of open office space inside? Anonymous (not verified) on Mon, 12/04/2006 - 10:26pm. Not solid concrete, but close. But I was talking about a bridge. This particular wall, the ONLY blast hardened face of the Pentagon, was just in the process of being hardened. Hani Hanjour allegedly made a 270 degree turn in order to hit the ONLY one of the five faces that had been upgraded to "blast resistant", the side completely opposite Donald Rumsfeld's office, which would have been a direct shot for Mr. Hanjour, absent the 270 spin turn. And anyhow, I made the comparison to the Middle Belt Parkway overpass brige and the Pentagon face, not the missle silo. Nice misdirection. My point remains. Jet into solid masonry object = truckloads of debris, lots of fire. Just like the pictures of 255.
craniac on Mon, 12/04/2006 - 11:06pm. So where is the rest of the Pentagon plane? "And, Aluminum airplane parts, steel and titanium engine components, and fireproofed seats, don't "burn up" in a hydrocarbon fire. Sorry, not remotely hot enough. Misses by 1000 degrees F. Oops for you." I know, so why are all these nearly indestructable parts missing, yet viable DNA (delicate organic material) was found for 63 of 64 passengers??? Anonymous (not verified) on Mon, 12/04/2006 - 10:31pm. "Because it is not visible"
Isn't it funny that Sandia NEVER showed as the rest of the video that would show the damage to the wall and any parts of the plane lying on the ground? They wanted us to see what they wanted us to. Killtown on Tue, 12/05/2006 - 12:39am. that slammed the pentagon @ 530 mph or disappeared in Shanksville with DNA or any other method. Ergo, the "official story" is a lie! Anonymous (not verified) on Mon, 12/04/2006 - 10:09pm. not to mention the 2 huge titanium engines. Anonymous (not verified) on Mon, 12/04/2006 - 10:18pm. Glowing Irony & Dripping Sarcasm Pulverized the 9/11 Planes??? Killtown, you ask: "Does anybody know another instance where a large metal object turned to powder after striking a harder object at a significant speed?" Yes, Killtown, other than Flights 77 & 93, there was another instance where a large metal object turned to powder after striking a harder object at significant speed. In fact, these phenomena apparently occurred two (2) (and only two) additional times in the history of the world. Both of these additional events apparently occurred on 9/11/01: i.e., when two (2) commercial aircraft (Flights 11 & 175) allegedly hit the NYC WTC towers. There are plenty of pictures & videos, many eyewitnesses, and much evidence (or a pulverized lack thereof) of the disintegration & pulverization of these commercial aircraft at & around the 9/11 WTC sites. No independently identified piece of the two (2) aircraft that crashed into the WTC towers has ever been found & publicly identified with serial numbers. Although there are uncorroborated reports that the "Black Boxes" (data recorders) from these commercial aircraft were supposedly found, this was never confirmed; and the U.S. Government has never acknowledged finding these Black Boxes (much less examining the contents). "Commercial Aircraft Pulverization upon Impact with Concrete, Dirt & Steel" may be an alternative hypothesis to the evolving "Official Government Conspiracy Theory" and to the much-maligned hypotheses of "9/11 TV Fakery" and "No Planes Hit Any 9/11 Sites." Therefore, Nico Haupt, The Web Fairy, Morgan Reynolds, and their group should go back to the drawing boards to consider "Commercial Aircraft Pulverization upon Impact with Concrete, Dirt & Steel" as an alternative hypothesis. Unfortunately, "Commercial Aircraft Pulverization upon Impact with Concrete, Dirt & Steel" only occurred on one (1) (and only one) date in the history of the world: September 11, 2001. Therefore, any attempt to replicate these phenomena will be futile. So, don't try this at home. This may have something to do with the fact that 9/11/01 was a special date in history, and it only occurred once. Otherwise, we may have no other explanation for these anomalous pheneomena, right? P.S. By the way, were any of you an eyewitness to the molten, glowing irony & dripping sarcasm pouring froth from your 9/11 (XP) Windows? Thomas J Mattingly on Mon, 12/04/2006 - 11:17pm. Then nascars would turn to dust if they hit the walls at 480mph. Killtown on Tue, 12/05/2006 - 12:44am. I can't even begin to imagine the leaps in reasoning you need to go through in order to justify the claim that Sandia National Labs was in on the conspiracy. Hmmm... or maybe they wanted to find out what would happen if a plane crashed into a nuclear reactor? It's really very foolish to suggest this obscure test had anything to do with 9/11... Just like it's foolish to suggest there's any reason Flight 77 didn't hit the building. Anonymous (not verified) on Tue, 12/05/2006 - 2:25am. and I'll think it's legit. Until then, my position is large metal object don't turn into powder after hitting something at high speeds. "Just like it's foolish to suggest there's any reason Flight 77 didn't hit the building." Killtown on Tue, 12/05/2006 - 2:34am. Where is there any evidence that whatever hit the Pentagon turned into powder? And if whatever it was turned into powder, then where did all the 757 pieces come from? Otherwise I'm not sure what you're getting at... what would you expect to be left of a plane after that kind of impact? Anonymous (not verified) on Tue, 12/05/2006 - 3:59am. Regardless of what hit the pentagon.. Regardless of whether or not flight 77 did hit the pentagon or not, the passengers were still murdered, as well as the victims inside the pentagon itself. Without clear footage of the strike, we can't be certain, we can speculate many different things, but one thing is for sure, the entire operation was an inside job! 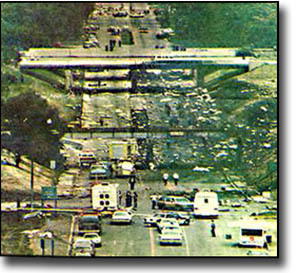 Whether passengers of flight 77 were killed when their plane hit the pentagon, or taken someplace else and murdered they were still murdered. The same thing holds true for flight 93, they were still murdered whether the plane was shot down, or they were taken someplace else and murdered. The 'let's roll' story is a complete lie. The twin towers and building 7 being destroyed with demolitions, with a couple of planes used for shock and awe value to cover up the use of the explosives blows the roof off of the enitre operation, that's why they refuse to acknowledge anything about building 7, and the use of explosives in any of the buildings. If it is ever shown that 93 did hit the pentagon by way of crystal clear footage (which could even be manufactured) it doesn't prove that the entire operation was not an inside job, because the precision at which the plane was guided to hit the pentagon proves it was indeed staged. The plane would have had to have been flown by remote control, and the manner in which it was flown appears to be impossible according to experienced commercial airline pilots. For that matter the same applies to the precision of the planes that hit the towers, how could they not have been flown without remote control of some type? Flight 77 hitting the pentagon just makes the murder weapon an uzi over a double barreled shot gun. It makes no difference to the victims, but proving who the actual murderers are, makes a world of difference! Ryback on Tue, 12/05/2006 - 10:16pm. 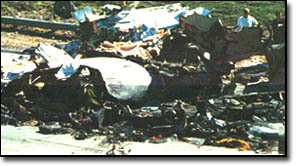 It is interesting to note that flight 255 ALSO hit light poles during it's final seconds. I wonder what they looked like. I bet they weren't bright and shiny. And re: the F-4 turning into powder; it is striking a hardened missle silo. It's not an aircraft test, per se. It's a ballistic impact test of a missle silo, arguably one of the densest, most well-built enclosures on the face of the earth. 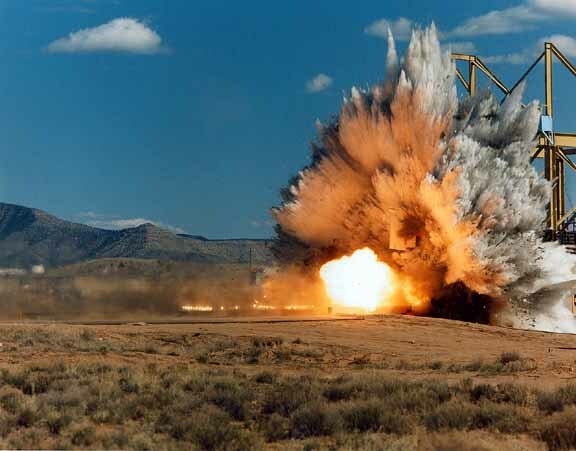 The F-4 was just used as a high speed projectile, and most cetainly contained supplemental explosives for the test, THUS turning into powder on impact. craniac on Mon, 12/04/2006 - 10:13pm. imgstacke on Mon, 12/04/2006 - 10:17pm. Yup, it was a nuclear vessel. My bad. craniac on Mon, 12/04/2006 - 10:26pm. a devasting crash, explosion, & fire. Anonymous (not verified) on Mon, 12/04/2006 - 10:23pm. As for the on-board fuel, it's "Jet A" also known as kerosene. Flammable, but NOT explosive. The explosion must have been caused by another mechanism. Damn those laws of physics. The just won't accomodate the Government lie. craniac on Mon, 12/04/2006 - 10:30pm. Anonymous (not verified) on Mon, 12/04/2006 - 11:25pm. but the required air/fuel ratio is not a given. If the fuel spills from a tank upon impact, chances are that it will not mix adequately to allow for an explosion before igniting, so what you get is just a fireball. bruce1337 on Tue, 12/05/2006 - 7:08am. What do I know about Kerosene? Plenty. It is not explosive. Energy is not created when it is ignited in a vaporized state, unlike gasoline. That's why Fire Code says it goes into a BLUE container, as a flammable, but not explosive, liquid. Gas goes into a RED can, as a flammable AND explosive liquid. Your statement about "any gas" being explosive is what we call "junk science", and the kind of stuff that misleads the general public about the truth movement. craniac on Tue, 12/05/2006 - 9:17am. it couldn't serve as jet fuel. 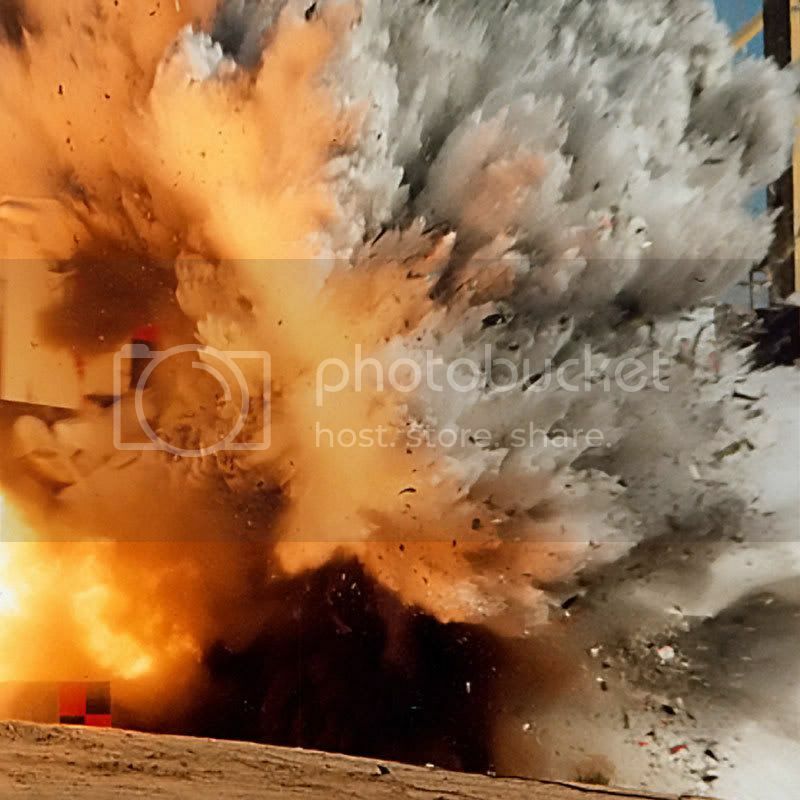 It's not quite as volatile as benzene, true, but mixed with oxygene in the right proportion, it will explode - the blast is what makes turbine engines go, after all. bruce1337 on Tue, 12/05/2006 - 10:15am. It's JP4....Just high grade kerosene.It blows my mind.We are going over & over all our justifiable questions like a dog chasing it's tail. We need Congress to ANSWER ALL the questions we have NOW! WISDOM on Tue, 12/05/2006 - 3:03pm. Anonymous (not verified) on Mon, 12/04/2006 - 11:07pm. It's in dispute whether the dummy F4 was equipped with engines, it is rumoured to have only been an airframe. After all, the purpose of this test was to determine the stability of nuclear vessels, and there might have been a vested interest to "prove" they were impenetrable. Furthermore, there seems to be no commitment from SANDIA to provide definitive data that I'm aware of. It would be very relevant to this discussion to know more about this experiment's results. Anyway, impacting at 480mph, certainly faster than a 757 can go at sealevel, the F4 allegedly penetrated only 60mm of concrete, which stands in total contrast to the damage to the Pentagon, which amounted to approximately 2700mm of concrete. This is independent of the total mass of the projectile and depends on its density (which is why DU is so popular for armor-piercing ordnance), so there's no apparent (or, frankly, conceivable) reason for this incredible discrepancy. Can't have the cake and eat it too - either the plane violently and totally disintegrated on impact or it managed to rival the most advanced "bunker busting" ordnance available - this is especially true for its twin engines, which apparently went AWOL. It could very well be that, apart from reasons of maneuvrability, the stopping power of massive concrete walls was one of the reasons to deploy something else than an airliner - or else, how could the beancounters in search of 2.4 trillion and the navy intelligence personnel be credibly added to the 9/11 casualties? bruce1337 on Tue, 12/05/2006 - 4:03am. I just want to commend you for a brilliant post. Very scientific. Thank you. craniac on Tue, 12/05/2006 - 12:19pm.